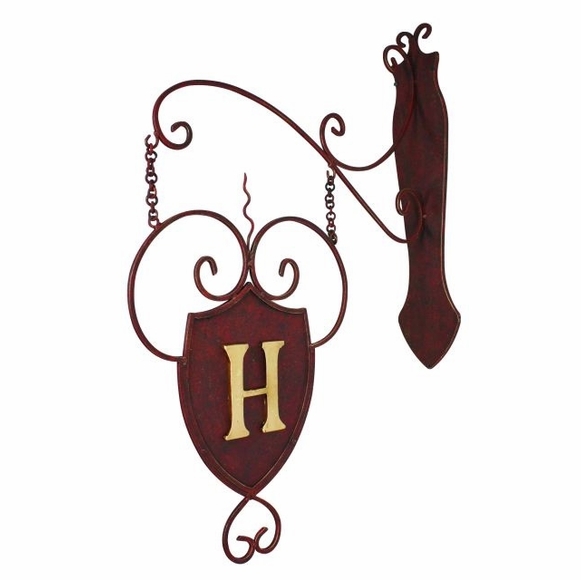 Hanging Plaque with Monogram - - personalized shield shape plaque with a single initial on one or two sides. Complete with wall bracket and chain. Hang on your porch in place of or along with a traditional address sign. Rustic brown gold monogram plaque consists of a shield set off by decorative scroll work and includes the wall bracket shown here. Personalized with a heavy 5" Italian gold iron letter. Note: the same letter appears on both sides of the 2-sided sign. Forged by master craftsmen of iron and tole. Hand-finished in a multi-step process. Bracket is 5"W. Overall height from bottom of shield to top of bracket is 33". Depth is 23". Shield only is 8.5"W x 12"H.
Special order. Please allow 3 to 6 weeks for delivery.